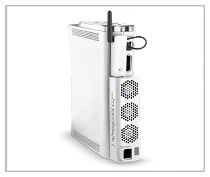 The Xbox 360 first came out, it was accompanied with complaints of heat issues. The new high end console, had some high end heat that could cause game and system crashes. Causing many consumers to shudder and clench a fist in frustration as the red light of death blinked at the front of the spiffy new Xbox 360 console. With the heat problem came some enterprising companies to snap up gamers cash with cooling solutions. Once such bit of hardware that also had a bit of a rocky start when it launched onto the scene is the Nyko Intercooler for the Xbox 360. I have to say I was not a big fan of the first incarnation of the Nyko intercooler. It seemed to cause as much problems as it sought to fix. It was speculated that this was in part an issue with the Intercoolers design. The connection that plugged into the back of the Xbox 360 was for the most part plastic. Some reports have this even melting into the Xbox 360 and causing damage. Having tested the first version, I myself happily never ran into that problem. I did run into power fluctuations game lock ups and even some electrical shocks. 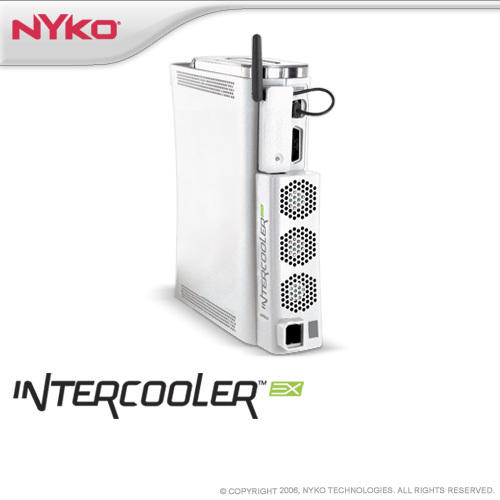 So when Nyko sent us another version of the Intercooler I was a bit skeptical to say the least. My worries where unfounded, the latest version of the Nyko Intercooler for the Xbox 360 actually works and works pretty well. Now before I go getting into the praises of this bit of hardware let me point out that unless your really, really stupid, you should know that your Xbox 360 needs to have a bit of space around it so that it is not suffocated from trying to run. Having it in a tight location or enclosed space is just asking for trouble no matter what kind of cooling system you have hooked to it. That being said let me say I was very happy to see that the connection that plugs into the back of the Xbox 360 (Which is a form of pass through really since the Xbox 360 power cord plugs right into the Intercooler and in turn into the 360.) is now metal. Maybe this grounds it better, I do not know. All I do know is, I have not shocked my self once on the Xbox 360 since using the new version of the Nyko Intercooler. Plus even better the system is running cooler. 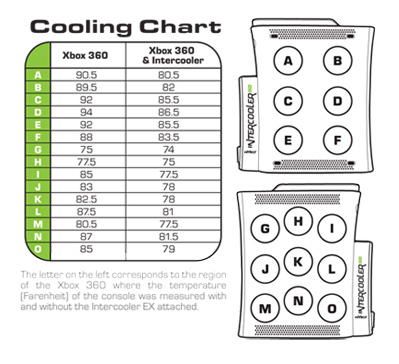 As noted the Nyko Intercooler for the Xbox 360 connects directly where the power cord for the 360 is located, then you plug the power cord for the 360 directly into the Intercooler. The three fans that are part of the attachment unit are designed to pull heated air from the inside of the Xbox 360., and thus helps keep the inside of the very hot running components from over heating. The instructions that come with the Intercooler are pretty straight forward and easy to follow. Making it a real snap (No pun Intended) to hook up the Intercooler to the gaming system. The intercooler fans though are a bit loud, but the trade off is good. A bit more noise to cool my gaming system, I’ll go for that. The only other down side is that if you have the wireless hook up on your Xbox 360, the Intercooler unit presses into the release clip of the Wireless unit and can cause it to unhook. But for the most part things stay attached, but none the less its best you’re aware of this. The latest version of the Nyko Intercooler gets a decent score this time around. I do not think they would have liked our scores for the first one. Check them out at www.nyko.com.